Visualise your past, present and future music. When Spotify released its Personalization API in early 2016, our close working relationship with them allowed us early access to build an experience based on them. 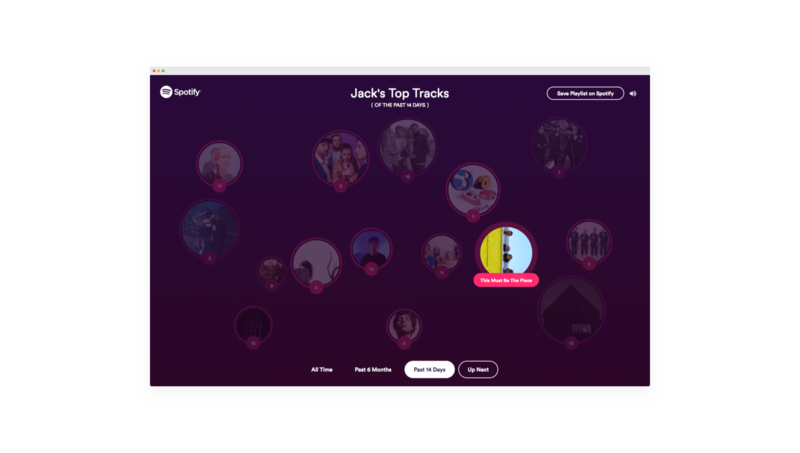 Inspired by Spotify’s focus to demonstrate their technological capabilities to advertising creatives, Hydric envisioned a web app that would graph a user’s top artists over various time periods and make predictions for what they might want to listen to in the future. Using the Top artists and Top Tracks API, we pulled the user’s top tracks for three time periods - ‘all time’, the previous 6 months and the previous 14 days. With these results we extracted the musical attributes of the tracks, such as tempo, valence, popularity, and others. These attributes were then plotted across each time period according to the user’s behavior and displayed on a graph. The concept around this was that the user would be able to see how their taste in music had evolved over that time period, such as increasing in popularity or decreasing in tempo. Using this data, we could extrapolate how much these attributes might continue to increase or decrease, and suggest tracks that matched the expected future listening behavior. However, displaying this information proved to be difficult. The musical attributes of the tracks during each time period varied little for some users, and radically for others. Finding an ideal scale on which to plot this information was therefore challenging and our developers were challenged by the wildly varying listening behaviors of our test users. To solve this dilemma, our developers worked closely with our design team, iterating often on different visual concepts that would better display the data. This process led them away from a traditional line graph to interactive and scattered images of top tracks. However, this new design was not without its own challenges for the developers, as it required custom layout behaviors. A further challenge in creating Visual Taste related to the future music recommendations feature. Simply using the musical attributes found in the user’s listening history to generate playlists didn’t guarantee appropriate results that the user might like. For example, a user interested in mostly pop music might have the same popularity, tempo and danceability attributes as another user that only listens to techno. 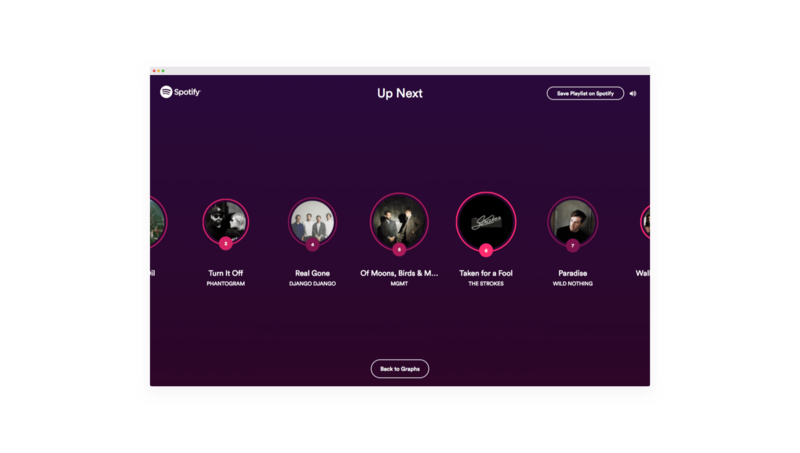 To ensure that the results were tailored to each user, we ensured that top played artists and tracks would be used as playlist seeds, so that Spotify would provide relevant future music recommendations. 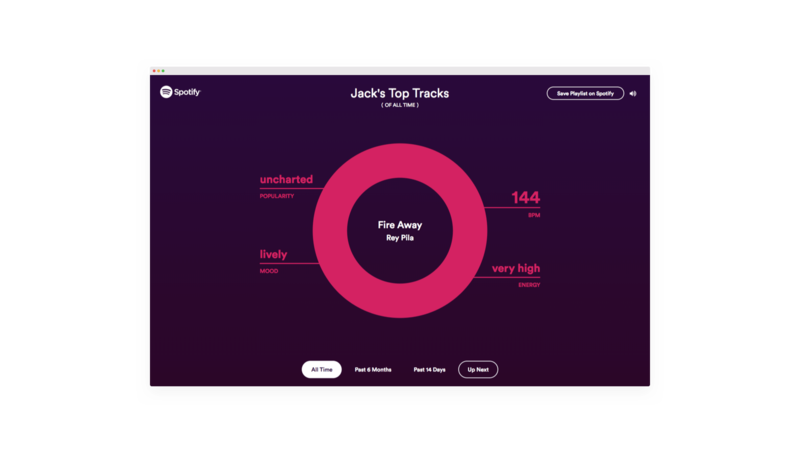 Upon completion, Visual Taste allowed users to connect their Spotify, view a visualization of their top listening habits from ‘all time’, the past 6 months or the past 14 days, and generate a playlist of the top recommended tracks they should check out next. We were able to confidently recommend these tracks based on their top tracks and included track previews so they could easily sample our music predictions before saving them as a playlist. Spotify engaged with Visual Taste so much that they acquired it, along with Playlist Playground, in March 2017 as a demonstration tool for the possibilities of the Spotify API for other builders of Spotify experiences.